This sensitive lab instrument is accurate to ±0.15% at its maximum setting. 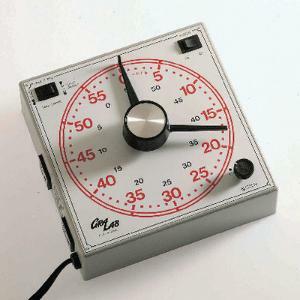 The dial’s larger numbers show elapsed time, while the smaller numbers can be used as a stop clock. It is composed of a sturdy polycarbonate case, built-in buzzer, and two separate three-wire outlet receptacles for automatic switching of appliances. Maximum load: 1200 W, 1/3hp. Range: 60 minutes (minutes/seconds). Dial size: 6 1/2" dia.